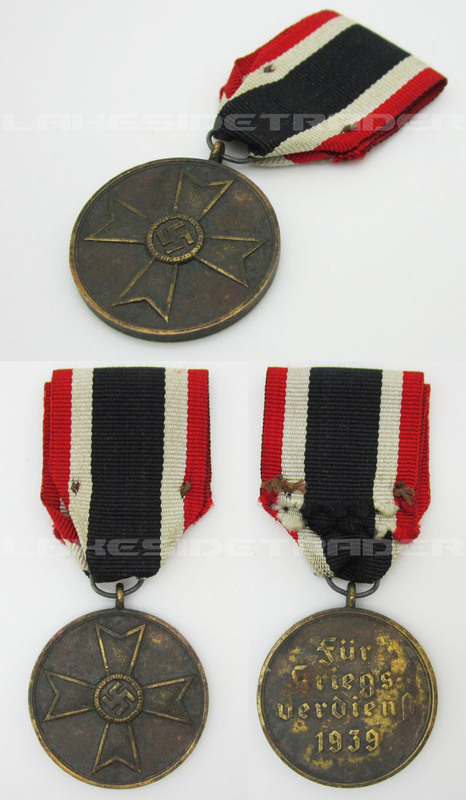 A solid 1939 War Merit Medal here! It is constructed out of a die struck, tombak base that has been bronze washed. The obverse of the round award features an embossed 2nd class war merit without swords. The reverse reads: “Für Kriegs-Verdienst 1939” (for outstanding services in war 1939). To the top is a soldered loop and post-war replacement ring which holds approximately 5 inches of 2nd class war merit red, white and black rayon ribbon that has been stitched together.